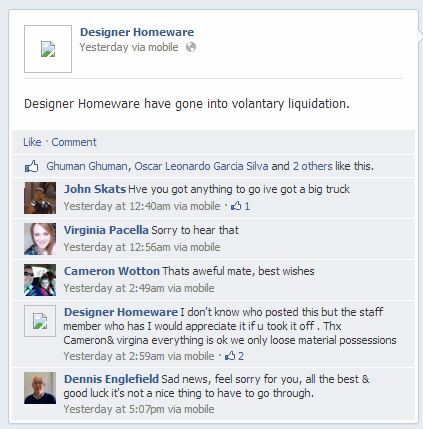 In the wake of yesterday’s news that upmarket Sydney appliance retailer Designer Homeware was in liquidation, the company’s Facebook page has been the scene of a bizarre exchange between a supposed staffmember and customers. A message reading, “Designer Homeware has gone into voluntary liquidation”, was posted yesterday afternoon by the page, which quickly received four likes and several comments from upset customers. “Have you got anything to go? I’ve got a big truck”, wrote one, followed by, “That’s awful mate, best wishes”, by another. Screenshot of Designer Homeware’s Facebook page. These messages were the first on Designer Homeware’s Facebook page since a Christmas message on 13 December 2013. Appliance Retailer has made repeated attempts to contact Designer Homeware proprietor Athan Papoulias and the liquidator, Joubert Insolvency.